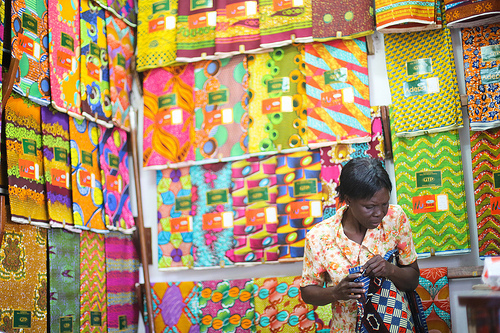 Vlisco is widely recognised as being unparalleled in its quality and reputation. The most superior wax print textile manufacturing company has enjoyed an illustrious history since first being established in 1846. Through developing their own unique take on Javanese Batik design, they initially created premium fabrics for the Indonesian market. However, by the 1920s, Vlisco had established their brand in West Africa, quickly becoming highly popular in this region, mastering the craft of creating a textile design that has since become intrinsically linked with West African style. While Vlisco is a widely recognised name, the recent influx of cheap wax fabric imitations from China have begun to replicate the classic Dutch design practice and make significant inroads in establishing their presence in the fabric market. This has prompted political debate in regards to the authenticity of West African wax prints as to who has reasonable justification to claim ownership over the recognisable textile designs. The classic prints of Vlisco are considered to remain reflective of quality, superiority and undeniable style. Here are some simple ways to ensure you have the genuine article and are not disappointed with a lacklustre fake. 1. Ensure the item has the iconic green and gold label that designates the product is of official Dutch origin. There should also be a ‘Sun’ logo present on the product, with the VVH crest in the middle. 2. Located on the edge of the fabric (the selvedge), you should find a ‘Design Number’ which should also match with the serial number that can be found in the white box on the green, rectangular label on the fabric. 3. The Selvedge refers to the unprinted edge of the fabric. The top selvedge should read, ‘VERITABLE WAX HOLLANDAIS VLISCO’, and on the bottom, you should find the text ‘GUARANTEED DUTCH WAX VLISCO’. 4. Lastly, on the rectangular label on the fabric, ‘PRINTED BY VLISCO IN HOLLAND’ should be printed. Through searching for these defining features, you should be able to ensure that you are purchasing a quality Vlisco garment and not a cheap imitation. To help in your confidence, choose to purchase your items from respected and reputable sources, such as us here at Empire Textiles.